Ray Hanania with Christian Lebanese politician Michel Aoun in February 2006, where I provided political and media consulting services in Beirut, Lebanon. Aoun later became Lebanon’s President. Ray Hanania, then National President of the Palestinian American Congress, meeting with Palestinian President Yasir Arafat at his Gaza Strip offices to discuss ways to revive the peace process in June 2005. Sadly the peace that Arafat and Israeli Prime Minister Yitzhak Rabin built on moderation, compromise and hope is being destroyed by extremists in Israel, Palestine and the United States. Greek Orthodox Patriarchate of Occupied Jerusalem Archbishop Atallah Hanna and Ray Hanania. Archbishop Hanna is a powerful voice for the Christians of the Middle East who have been abandoned and forgotten by Christians in America and in the West. Israeli Supreme Court Justice Salim Joubran, a Christian Israeli Arab who believes in building peace through involvement, not rejection, with Ray Hanania in 2017. Ray Hanania with Yaser Abed Rabbo head of the Palestinian Negotiations Affairs Department in Palestine in 2005. 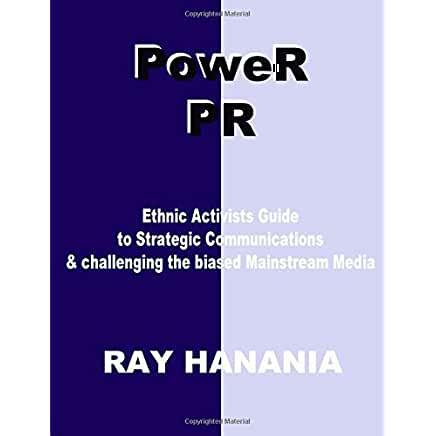 Hanania was hired as a consultant by Abed Rabbo to provide communications strategy organizing several press conferences and a communications strategy plan for Minister Rabbo and for his media team. Images Conference in Dearborn Thursday — with Ali Baleed Abu Dhafer, Edward James Olmos and Tim A. Attalla. Harry Golden Jr., stands front-and-center with Mayor Washington and members of the Chicago Press that covered City Hall full and part time. Comedians Patti Vasquez, Ray Hanania at Zanies in St. Charles in early 2002 before Jackie Mason banned me from performing at Zanies in Chicago in August 2002. Ray Hanania at his Sun-Times desk in May 1989, following the passing of Harry Golden Jr.